Ladies and gentlemen, boys and girls, it is, it really is. Today is the day dedicated to the (largely) male phenomenon that is facial hair. Not just of the top lip variety, either. No. This is the full monty, in all its hirsute variety. Today is World Beard Day. Mind you, it's not for the want of trying or temptation. 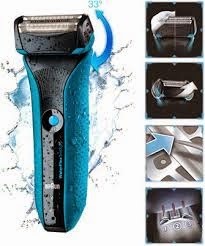 Shaver manufacturers in particular keep dangling their wares before my eyes and - since the styling of my own growth as 'goatee' - there has been a need to keep the cheeks (facial) smooth. But as a confirmed wet shaver (and I mean wet - I only ever shave in the shower) my interest in electric facial depilatory products has been minimal, to say the least. So when I was asked to test-shave the Braun WaterFlex just recently I was intrigued, and happy to oblige. "...inspire men to unlock a whole new world of shaving, and to feel the unbeatably smooth skin feeling of a shave with water, foam or gel. Specially designed for use with water, foam or gel, WaterFlex transforms electric shaving into gliding, leaving men’s skin feeling perfectly refreshed." So does it? You'd have to ask my wife. Unbeatably smooth skin is her department. But as a man, limited beard wearer and only occasional shaver (once every couple of days, usually) I can at least confirm that the Braun WaterFlex does the job, does it well, is comfortable, doesn't slip like a bar of soap in the shower (it has a specially-designed non-slip grip) nor electrocute the user (it has a clever filter keeping water from the business end of the shaver) and generally does the job painlessly. Oh, and it recharges quickly (just over an hour) too. If I didn't have a beard I'd use it on my chin!